SendSafely was awarded the highest possible rating from the team of judges, comprised of working executives from the cyber security and information technology fields. The proprietary and unique scoring system selectively measured performance across multiple business domains and rewarded those companies whose achievements stood above those of their peers. SendSafely is thrilled to have been chosen as one of this year's winners. 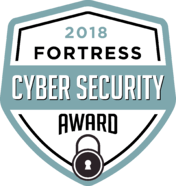 Visit the Fortress Cyber Security Awards website for the complete list of winners.